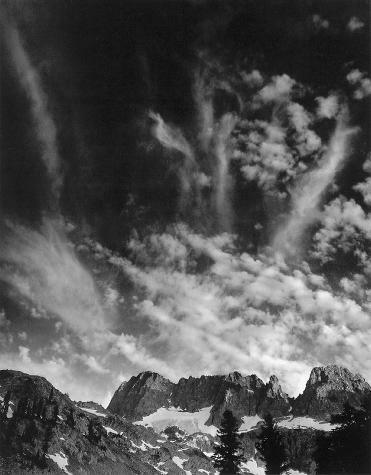 Ansel Adams: "Clouds, Sierra Nevada." The old man fell asleep in his chair. He died. He only knew that he died because when he sat up, bleary, everything around him had turned to foggy shapes. From his upraised hands extended, upward, a ladder wrought of light. He began to climb, with no effort, feeling the way he had as a boy when he had lifted his smiling father in the pool, amazed at his own strength in the water. It was like being a weightless astronaut. He could climb forever, without effort. With no muscles to tire, with no heart to race, with no brow to sweat, "effort" was a word with no definition. He climbed and climbed until he reached a platform of mist where some others had stopped climbing. 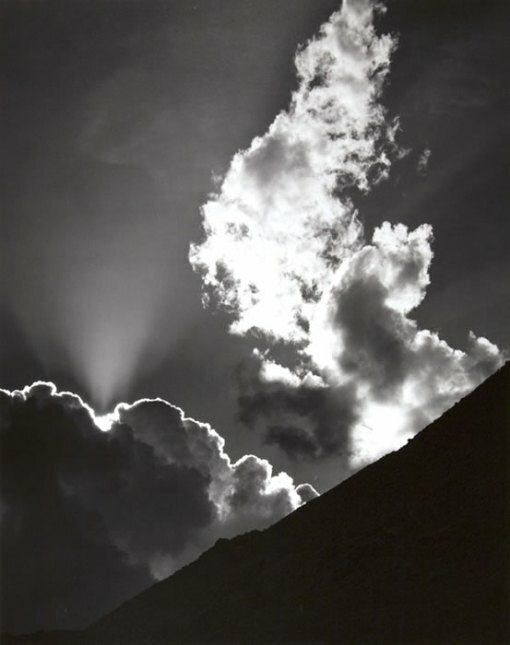 There, near his ladder, hovered a guardian spirit, as bright as a solar flare and as dark as anesthetic sleep. Without speaking, it said, Go. Climb. And the soundless tone of those words made him feel as happy as a cuddled dog. He went ever upward, passing spirit after spirit and level after level upon which others had stopped their climbs. He'd receive the same praising command from each guardian, knowing their invisible, loving smiles in his watercolor soul, but wondering why some had stopped such an easy climb. Hundreds; thousands; millions of misty levels passed below him. Looking down, he saw his body in the chair. It was trillions of miles away, but he looked upon it without regret; without nostalgia. He smiled -- or something like it -- knowing, now, the ridiculousness of the things that brought that body happiness. Looking up, he saw no end to the ladder. Before long, he reached another misty platform. Go. Climb, intoned the spirit there, as all the others had done, filling him with contentment. "There is so much joy in climbing," he said to the spirit. "I would climb forever if I could. Will it end?" The spirit formed a face that was at once the climber's own; his father's; his mother's; his children's; his wife's; his favorite teacher's; his grandfather's; his best friend's and the faces of anyone he had ever helped. It was the face of his past loves, it's eyes filled with tears of joy and tears of warm goodbyes; it was the face of the journey from the Tooth Fairy to the Easter Bunny to Santa to God. It was the face of complete understanding of all that can be understood. It was the face of Tao. The ladder is yours. The rungs are the love you have given in your life. The face stopped changing, then. The eyes were again those of his wife; the same eyes that had looked at him in the softness of their wedding bed, so many decades ago. "Go," she said, through joyous tears. "Climb, Jake." There was no soft hand to touch him, but it caressed his cheek, nevertheless, and up he climbed, the ladder stretching farther than he could see. But now he knew where it ended. He knew.